Kinsler was scratched from Wednesday's spring game against the Angels due to a jammed finger. Kinsler was removed from the lineup earlier in the day but the reason for his absence was previously unknown. 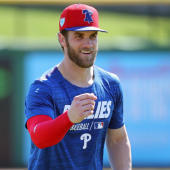 The team currently considers him day-to-day but it wouldn't be surprising for the veteran second baseman to get at least a couple days off to facilitate a clean recovery.